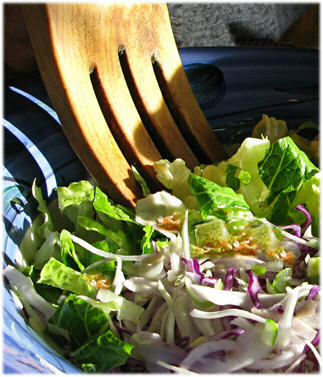 We're still in our jag of having a cabbage salad for lunch. Today we made it with both red and green cabbage (super finely shredded with our ceramic blade mandoline), along with grated parsnip, and green onion. All topped with this wonderful sesame veggie mix (inspired from gomasio, Japanese sesame salt), and a little dressing made with oil, stoneground mustard, agave, and apple cider vinegar, or, a light avocado dressing. Yum! The rich orange color looks beautiful against the various greens in a salad. 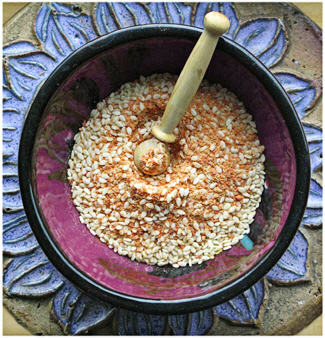 Use Sesame Veggie Salt in sauces or dressings for instant taste and texture, sprinkle onto a sandwich, or into soup. Crudités have never tasted so good! After preparing veggies, grind everything (except sesame seeds) in food processor. Spread out on teflex sheets or glass baking dishes. Place in dehydrator for about 4 hours (or until dry) with temperature set to 105 degrees. When veggies are dry, place in coffee mill and grind until powdery. Putting it all together: Use 3 tablespoons veggie powder with 6 tablespoons sesame seeds. Mix well and put into spice jar. There are at least a dozen kids on our street. There's one little girl that stands out from the rest because she exibits such an exuberance for life. The way she walks or runs, leaning into her stride, looks like she can hardly wait to get to where she's going. She's my teacher, reminding me to be eager. Every day we have opportunities to move through resistance, to become a little bit stronger, and have our character polished—or even to eat a slice of humble pie (does anyone have the recipe?). When things are challenging, I sometimes remember back to being a child, to a time when I had to learn absolutely everything from the beginning. There is not one skill that I now enjoy that I didn't have to aspire to at some point. Take this recipe: It uses a dehydrator, and if you don't have one, this might feel like a form of resistance. Yet with a simple reconfiguration, these same ingredients would make a lovely salad or fixings for a wrap just by adjusting the amounts of the carrots, bell pepper, celery, parsley, onion, sesame seeds, garlic, salt and pepper. So this week I'm reminded to dig in and savor each moment, whether it's pungent, salty, bitter, or sweet. Life has it all—and life itself is our greatest teacher!